Boy oh boy was last weekend a good one. So many lovely things happened within our two days together...I just don't even know where to start. How about this: Well hello hello! It's Wednesday!! You know what that means! No? Neither do I. Felt like the right thing to say, though. For one, my husband came home from work and started our weekend off just right- with the most gorgeous pink flowers I have seen in a while. These flowers- shoot what are they called? ?- are big, and puffy, lovely, and just bursting with love. I adore getting flowers. I didn't used to- tried not to be that girl (don't ask why)...but over the years, I can't help it. 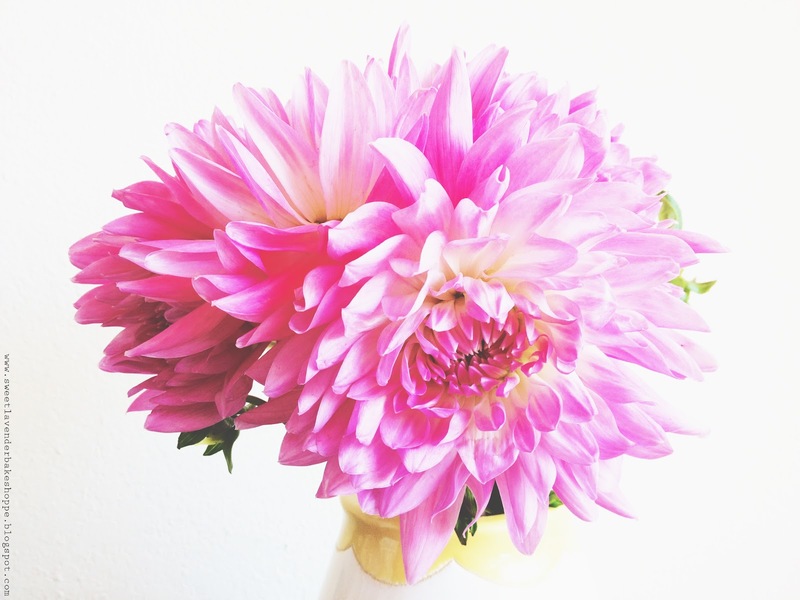 A bouquet of beautiful lovelies like these, brought to you by the love of your life- how can one not like them? I did have to work...but just a little so it wasn't too bad. I had a little order that needed to be completed and shipped by Monday so I happily gave in to my quick little work-weekend-session. I can't really complain though- I love making our edible paint palettes. Every time they're ordered they're needed in some vibrant and unique color combination. It's cool to see what color themes people need. This order was for a wedding in which the bride and groom needed these cuties in the hues of dark purple, bright orange-yellow, hot pink, and shimmery silver. Here's a little secret- I loved this color combination so much that I might...dare I say...have a new favorite. They came out awesome. As every single person living in the United States knows by now- we're having a sort of heat wave- nation wide. ITS HOT! Even here! Who would have thunk?? Who knew our little town could actually raise it's temperature above 70? I am enjoying it though. Sometimes. Most of the time. Well I'm trying to at least. It's getting kind of ridiculous...I mean...it's really hot guys. I know, I know- "cry me a river Christina"...I know we don't compare to the 115 it was in Palm Springs the other day...or the high high temperatures it's been in states like Arizona! Anywho, one "person" who has NOT cared about the heat is this lovely lady- Princess Mombi. She has actually enjoyed it more than I! I've caught her laying and rolling around in the hot hot sun during the warmest times of the day! I can't believe it. Here I am, trying to desperately cool down STAT and I look over my shoulder to find her looking at me, upside-down, rolling and loving her sun bathing time. I can almost hear her saying, "Wimp". The last day of our weekend was the best. We were hot. We were needing a pick-me-up and just then I remembered I still had some money on my gift card to Susie Cakes. YES! You might remember this awesome experience I had last year? Yeah...almost a full year later we STILL had money on the gift card prize I received from that! YAY! That meant two things: 1. More cake for us! 2. We're not the total fatties I thought we were/would be! Hooray! So we drove to our nearest Susie Cakes location, shared a HUGE slice of our favorite- Tropical Coconut Cake (coconut cake, cream cheese frosting, pineapple bits, more coconut....my oh my) and enjoyed every last morsel. Monday was special for another reason though. After 3 LONG years of penny pinching and saving- we finally had enough to purchase a MUCH NEEDED new computer. AHHHHHHHHHHHHH! <-- Hyperventilating. In...ca$h. I feel the need to add a dollar sign to that. We felt like ballers. Who walks into an Apple store, with A LOT of hundreds and buys a new iMac...in cash? We do. Haha. Back story- while we were engaged and when we first got married our credit cards were our best friends. BAD IDEA. Horrible idea actually. With 19%APR on ALL purchases...we quickly ran into an immense amount of debt. Enter a family emergency right after that and wham we max out our credit card. Ugh. Our bill was (and still is) amazing. I don't know how we pay it off each month. Actually I do- God's provision. SOOoOOOOOoo, long story short, we humbly learned that credit cards = bad bad bad and we vowed to never use one again. Month after month we forced ourselves pay off the credit cards we had maxed and eventually have rid ourselves of all but one credit card since! Here we are 4 years later- almost about to pay off that 4th. Almost. There's still a little while to go :/ We penny pinch like crazy now- we put a little money into our savings each month...and if there's something we need or want to buy, we save up for it. The end. No if's, and's, or but's. Sometimes an emergency does happen- and its at that time we're really happy to have been saving every month. The nice thing is- even though "emergencies" do happen (you know, like this and this) and we end up dipping into that savings, we still do eventually save enough for those large purchases we need. Like this darned computer. My husband's MacBook he's been using is...humorous, if anything else. He bought it, used, in '07 and uses it EVERY day. It's big. It's heavy. It's held together in some areas by tape (no joke), it's a workhorse, it's his life, it's needed in order for him to make more ca$h money for us, haha. Oh right. Mombi-girl loves our iMac too. Or at least the box. 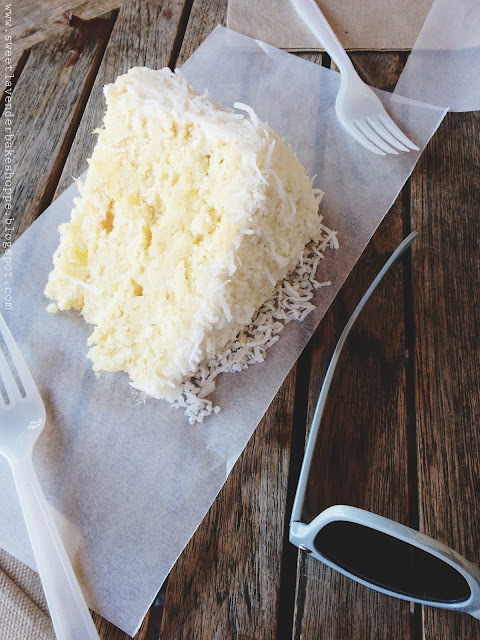 And that Tropical Coconut Cake looks amazing! Wish I could have a slice!